"Born in Colorado in 1948, I moved to Ucluelet, British Columbia, Canada in 1979. I immigrated as an oyster farmer, thus the handle of ‘Oyster Jim’. Soon after settling here I started talking about constructing a walking trail along this coastline. That dream resulted in the establishment of the Wild Pacific Trail." - Jim Martin. “I start from impossible and work backwards from there,” trail maverick Oyster Jim Martin said of his approach to building the Wild Pacific Trail along Ucluelet’s spectacular coastline. “We have this diamond in the rough and here I am polishing away at it. I can’t believe I have this palette on which to do my artwork. I have encountered many people out on the trail crying…they are so excited to be on the trail and taking in these views,” said Martin. For his visioning and long-term efforts at bringing Ucluelet’s local gem to life Jim recently received Ucluelet’s Citizen of the Year Award. “The perspective from shore is completely different from viewing it from a boat or from an airplane,” says Jim. Inspired by his initial exploration of the coast, both offshore as a fisherman and as a hiker navigating rocky headlands, he first began talking about the idea of a trail in 1980. Jim’s enthusiasm for the trail is infectious, but he would need to persist in his vision for a free public use trail for 16 years – approaching Council twice – once in 1988 and again in 1996 - before getting the go-ahead to build. He also credits Charles Smith, then representative of Weyerhaeuser, for his encouragement and support in those early stages to help gain access to private development land. The new Ancient Cedar’s section is a wonderful illustration of the away Jim applies his intimate knowledge of the coastline and artisan’s eye. He surveys and sculpts each section of this nature trail using green trail building practices. “The District of Ucluelet has been understandably very supportive and made this new section come to life through their support,” said Jim. 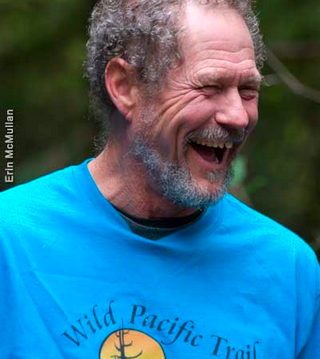 Together with the Wild Pacific Trail Society, and the community of Ucluelet, Jim is still working towards creating an unforgettable firsthand experience of the coast. The dream is to reach Half Moon Bay to connect to the existing trail network through the Pacific Rim National Park to Long Beach. To learn more about the history of this trail watch this 22-minute VIDEO by the talented filmmaker Lance Blackwell, who is a Social Butterfly Club member that introduced me to "Oyster Jim" and his amazing work in 2009.